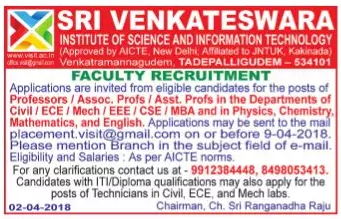 Sri Venkateswara Institute of Science and Information Technology, Tadepalligudem has advertised in Sakshi for the recruitment of Professor/Associate Professor/Assistant Professor job vacancies. Interested and eligible job aspirants are requested to apply with in 9th April 2018. Check out further more details below. About College: Sri Venkateswara Institute of Science & Information Technology, popularly known as VISIT was established in the year 2008, by Sri Gayatri Academy of Technical Education in Venkatramannagudem, Telikicherla road, near Tadepalligudem of West Godavari district. It is located away from the hustle and bustle of the city life in a scenic and serene environment spread over an expansive 10.49 acres amidst the lush greenery of mango and Cashewnut fields of Venkatramannagudem Village just 10 kms away from Tadepalligudem and 1 km away from Dr Y.S. R. Horticulture University and 5kms away from National Institute of Technology, Andhra Pradesh.